I just recently watched North and South - a BBC miniseries based on the novel by Elizabeth Gaskell. It is amazing. I was expecting to like it, but I love, love, love it! It's the story of a young woman from the quiet and picturesque South who goes with her family to live in the industrious North. There she meets interesting characters and is faced with a reality she had no idea existed when she befriends a humble working class family who work in the cotton mills of the town she now lives in, Milton. She makes snap judgments about an important business man (and love of my life! ), owner of one of the largest mills there, as she constantly sees him in unflattering and out-of-context situations. She is a bit harsh and unforgiving - and a bit stuck up - at first (such a whore). At the same time, her actions are often misinterpreted as she has no idea of what is socially acceptable there and seems to make many mistakes of her own in her interactions with the humble residents of Milton. The characters are beautifully cast, the story is wonderfully compelling, a must-see for anyone who loves romance, drama, amazing production and acting. 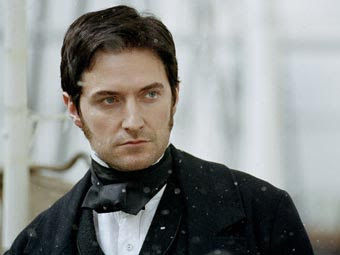 The male character played by Richard Armitage - be still my heart - is so charming and powerful. He's a "brooding" type of hero and will melt even the most cold-hearted spinster (you know who you are). If you get a chance look it up and give it a go. It's so worth it! Some of my favorite moments are when Mr. Thornton says to Margaret as she's leaving: "Turn back. Turn back and look at me". And then there's another moment where he says: "Are you coming home with me?" - OMG - mi corazón. Hey, SOMEone has to be the cold-hearted spinster and make up for all the sighing and weeping of the romantically inclined! Oh, I want to watch it! SUCH a good series! Man, good ol' BBC never lets you down - this was another one of my favorites (along with the classic, BBC's 6-series "Pride & Prejudice") and like you said, I thought I would enjoy it, but I LOVED it! Very well done! Oh, oh! And when she throws her arms around him! - Swoooooon! I saw it in 2008 and then so many things have changed in my life! I love this series. And Richard Armitage.